2. a late 70s punk/new wave band from San Francisco fronted by William Novak, who also started Dumb records with the band being the label's first release. 3. a Swedish band who are now called Antennas. 4. a Swedish guy called Andreas Novak. 5. a Scottish guy called Kenny Mooney. 6. a French screamo band. "A layered expanse of percussion, guitars, vocals, flute and various lo-tech instruments" from Birmingham, from 1995 to 1999. When gotlandic band Kinkaid split up after playing together for four years in the fall of 2002, they left a big void in Gotlands musicscene. With their experimental mix of powerpop, psychadelia and reggae they left their fans wanting more. Out of the ashes rose; Novak, consisting of some of the founding members of Kinkaid. While maintaining their diverse musical infuences their focus now lies on crafting powerful and moving songs. Novak is a pop/rock band with a quite own brand of quality songwriting, dabbling in pop, rock, americana and 70?s balladry but they're not a retro band and have created a up to date and very own sound of their influences. Their live performances possess a rare intensity and leaves you with a warm, happy/sad feeling as the band guide you through their own unique brand of quality songwriting, dabbling in pop, rock, americana and 70?s balladry. The lyrics often tend to deal with the frustration of everyday boredom, sometimes born out of living in a small town, or on an an island in the middle of an ocean. In other words; classic escapism. Their debut, album was recorded and produced by Pierre Lindsj?? in his studio studio Konst&Ramar (where he have recorded bands as Ceasars Palace, Dungen, Empire Dogs, Strip Music and many more). 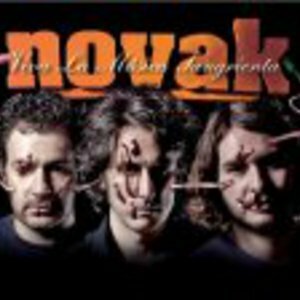 This Novak are no more and some of the members moved on and formed the band Antennas. Novak is also the name of the solo project of Kenny Mooney (also of L.I.N.E). Drawing inspiration from a variety of sources, including film, politics, and literature, musically Novak is hard to describe. With one foot in the world of post-rock and the other in drone and noise, Novak brings together many different sounds and ideas to form a dark shadow of a sound.